…you’re ready to start a new screenplay so you’re flipping through your ideas file, and nothing is begging to be written. …you just signed with a new manager and have been asked to pitch him 40 new ideas at your meeting next week. 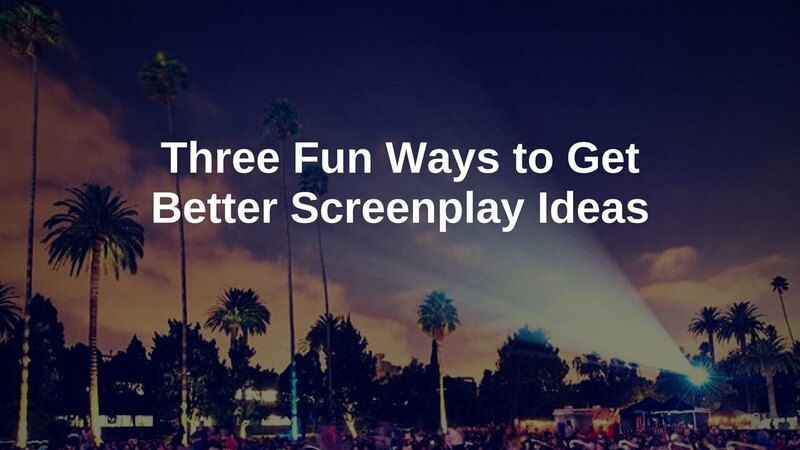 If you find yourself in any of these situations (or if you just want to practice generating ideas because it’s good for your screenwriter brain muscle), here are three methods you can use to come up with a bunch of story seeds quickly. Note: I call them story seeds because what you’re coming up with in this initial step are not yet complete screenplay concepts. I mean, I think that’ll be pretty obvious, but still – I’m all for clarity of mission. The whole point of this brainstorming is to generate sparks, and later you’ll see which of them catch fire. You’ll further tweak and hone those sparks that attract you most. But the first step is to generate them. Little nuggets of ideas that didn’t exist before. And to do that, I have three exercises– Wait, that sounds like work. Let’s call them games. No pressure there. Three new games to play. In this one you start with any existing legend, fairytale, or public domain IP. By way of example, I’ll start with Mulan, the legendary Chinese woman warrior who disguised herself as a man in order to join the army. Then, brainstorm five other points of view on this story’s events. Each of these points of view can give rise to their own familiar story shapes, tones, and genres. Let your brain go where it wants, and write down as many ideas as you can capture. Now, I don’t actually know the story of Mulan, so these potential story POVs are all made up. That doesn’t mean I couldn’t use them as a jumping-off point for my own story, however closely or distantly related to the original Mulan tale as I decide I want it to be. You might come up with an interesting dynamic and then decide you don’t actually want to tell the story of Mulan through other eyes, but you do want to tell a story of female sibling rivalry set in the contemporary world of the U.S. Marines. Remember, you’re just generating story seeds. You don’t have to use them. They don’t all have to be good. You’re just collecting as many options as you can so that later you can look for something that sparks your interest. Later you can follow that interest to a story you are passionate or curious or excited enough about to spend the next several months writing. Right now we’re just putting everything into our grocery basket. Later we’ll decide what to cook. Take any life phase, rite of passage, or other universally understood situation, and add a fantasy (or supernatural, or sci fi) element. Brainstorm “What if?” using both of those elements in as many different ways as you can. What if a teenage girl died and came back to haunt the crush she never had the guts to approach when she was alive? What if a teen boy’s high school crush died, and he started seeing her ghost everywhere, slowly driving him insane? What if a grown woman was being haunted by her long-dead high school crush? After further development, maybe one of those ideas would have become Over Her Dead Body. Maybe it would have become Ghost. In this game you’ll take just the headline as your inspiration, and twist it to come up with new stories. Use what you know about common movie types to pull out the different plots this headline suggests. When a garbage collector learns he only has six months left to live, he embarks on a cross-country road trip to locate the original owners of books that have personal inscriptions written in them. A garbage collector gathers discarded books and creates a free library for his struggling community, only to find himself in a David-and-Goliath struggle against the city library system. A garbage collector uses his access and unique connections to steal back valuable first editions that were stolen from his father thirty years earlier – and now reside in the private collection of the wealthiest man in America. Okay, so are these great ideas? Not yet. Brainstorming, remember? Looking for things that interest us. We’re paying attention to our attention. And the key in this game is to find familiar story shapes that you can combine with the elements of the headline that capture your attention, giving you the beginnings of a fresh + familiar concept. Now what? Once you have all of your story seeds, the next step is to start shaping them into sentences to get an idea of what the basic-but-solid story foundation could be. What’s “familiar”: Is it a classic heist? Is it an epic romance? A road trip? What’s “fresh”: What’s unique about the idea? Does it have a “strange attractor”? And if your ideas are feeling bland, uninspired, or cliched, you can target your brainstorming to isolated elements. There are a bunch of areas you can look at when you want to tweak an idea to give it a fresh hook. Perspective – Do we commonly see this type of story from one point of view? What other possible POVs are there? Opposite (or unexpected) profession – Instead of a cop hunting the killer, what if it’s another killer? Or an illegal immigrant? Opposite (or unexpected) social standing – What if the presidential candidate in your story was a homeless person? Location – Can you make this either the fresh or familiar element to balance the other aspects of your concept? As you work through all of your brainstorming, the ideas that attract you the most will become obvious. Shape those ideas into complete, viable loglines. Then, if you’re feeling brave, test your new loglines out on friends, mentors, other writers. See if your favorite ideas grab their attention too. And if you want another set of eyes and a quick opinion on what’s fresh + familiar about your concept, email me. I’d be happy to give you my two cents. Another fantastic article!Loaded with great brainstorming ideas. 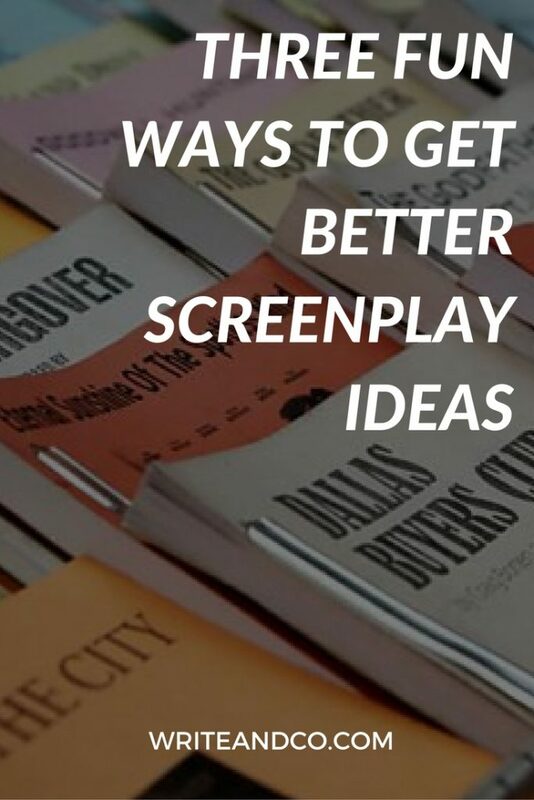 After reading your post on screencraft about “Three Fun Games to Help You Find Better Screenplay Ideas”, I decided to read your blog. Naomi you doing amazing work! Thanks! Woooow! What an interesting article! Thanks, Jimmy! Glad it’s useful and I can’t wait to see what you come up with! Really fresh and original way to come up with new concepts! Hi Naomi! So I’m starting my first screenplay, and I’ve followed all the articles you’ve written up until this one and I just want to say thank you! My experience has been made much easier with your help. Hi! Thank you so much for letting me know — I’m glad to hear you’ve found the articles useful! Good luck with writing that draft and please let me know how it goes!